We’re not saying that Christmas is bad on a cruise ship but if you’re new to cruising and never cruised this time of year then there are some things you may not expect. It also depends on what type of festive cruiser you are, there’s the couple who hate Christmas and just want to get away from it all and there’s the family who wants to do something different for a change or just wanna break from the kids! You might think once you arrive onboard you’ll see decorations all over the place, well your wrong! 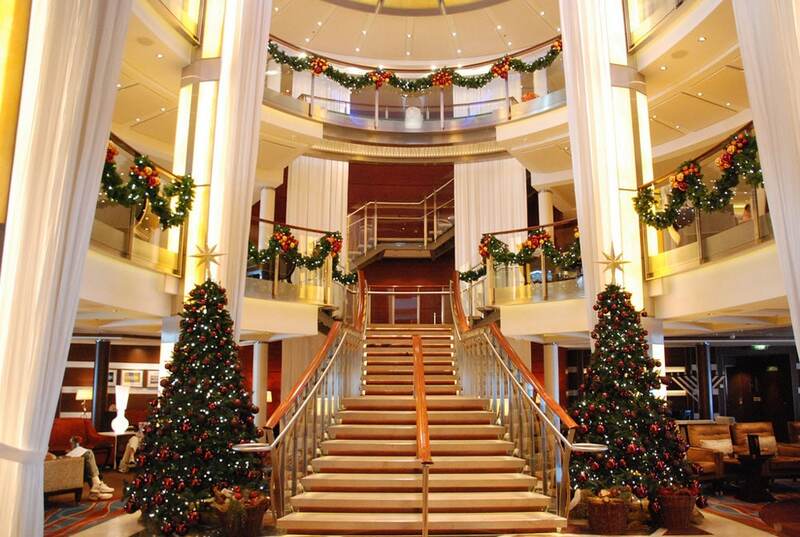 On most ships, you’ll only come across Christmas decorations in the main public spaces such as the atrium, theater lounge and other spaces where many guests usually crowd. Most often you won’t come across any on the stateroom decks and even possibly on the open decks. There have been some ships where even just a few places have been decorated. We won’t mention what ship but on when we cruised on even the Atrium was lacking that festive feeling and the decorations were looking pretty bare boned with hardly any tinsel. On most ships, you’ll find a large Christmas tree in the main atrium or a main public space. The tree can usually be found near the ship’s main elevators and staircase. Some cruise lines go all out with a large tree with plenty of festive decorations and lights but others will go for a smaller one that looks more like something from your living room. Cruise Lines usually put on very good Christmas shows and activities and these can define your Christmas cruise experience. You’ll get to see a festive music performance by entertainment staff during the cruise. For kids, it gets even better because they get the chance to meet Santa Clause himself! If they are good he might even bring along his sack full of gifts. The ships staff will also put on several activities during the voyage to keep the kids happy. The shopping onboard probably won’t change so don’t expect any huge Christmas sales. The sales on the current voyage are just as important as the previous or next voyage. There might be the last day special but it won’t include any Christmas merchandise unless it’s something like chocolate or candies made in the ship’s galley. OK, we just had to include the dining and this doesn’t really match our article title but Christmas dinner is one of the most important dinners of the year and when it comes to this cruise lines never let us down. With all the great dining option available especially with the newer ships you CAN expect an amazing Christmas dinner. They’ll only do it once onboard so choose your dining venue wisely. So remember when people tell you that they are heading off on a Christmas cruise then it really means no opening gifts around the Christmas tree on Christmas day but instead sipping on a cocktail and getting some sun on the open deck! Not everyone has a loving family to be with each Christmas so for some a Christmas cruise can be better.